Enjoy a complete experience with a Galapagos cruise and a trip to mainland Ecuador. Learn more about the rich Ecuadorian culture, from its natural sites to its delicious cuisine along with adventurous activities. Experience "the country of the four worlds" at its full potential! Overnight at First Class Hotel. Colonial city tour: Quito displays the largest colonial town of the Americas and is the first Unesco’s World Heritage Site. Enjoy the eclectic architecture ranging from the modern quarters to varied colonial facades on churches and private residences decorated and balconies built along the last five centuries. The tour includes parks like El Ejido and Alameda, the monument of Simon Bolivar, the gothic Basilica of the Heart of Jesus, Independence Square built during the past five centuries and flanked by the Presidential and the Archbishop’s palaces dated back to XVII and XIX centuries and, the Metropolitan Cathedral with excellent samples of the Spanish renaissance. Approximately 11 miles (18 Km.) north of downtown Quito, we visit “Mitad del Mundo” (Middle of the World) and the Equatorial Line Monument situated at 0º0’0” latitude where the eighteenth century French Geodesic Expedition erected one of the three pyramids as landmarks for their planet calculations to deduct the shape of the planet in a complex which replicates colonial architecture, a typical central plaza, a church and bull-fighting ring. Overnight stay at First Class Hotel. The tour begins visiting the Centenario Park devoted to the independence and freedom of the old city from the Spanish domain to continue on to the legendary Barrio Las Peñas, the original and only surviving colonial district of the city where you can have some fantastic panoramic views of the city and Guayas River. All-inclusive 3-night deluxe cruise. Only a special few have the chance to travel through this paradise, sailing on a charming ship, with nautical interior decoration of wood and brass, featuring ample outer decks, sea view cabins and suites, jacuzzi, swimming pool, bars and more. See prehistoric iguanas, giant tortoises, exotic birds, plants and beautiful landscapes of volcanoes, lava cones and magma flows. Swim and snorkel at any time of the year in the warm clear waters among tropical fish, manta rays, sea lions, swordfish, sea turtles and other marine wildlife. Multilingual naturalist guides lead shore excursions twice a day to a place unlike any other full of wildlife that has no fear of man. Lectures explaining the geology, history, evolution, flora and fauna of the islands are provided in several languages (upon request). A selection of meals, from buffet breakfast to gourmet dinners, ice cream bar, and evening barbecues. Enjoy your last excursion by morning. Disembark at docks in Baltra, transfer by bus to the airport for the flight back to Quito or Guayaquil. On arrival at Quito or Guayaquil international airport you will be warmly welcomed by one of our representatives, then you will be transferred to the hotel for check-in. An All-inclusive Galapagos Cruise experience on board of this comfortable and luxurious boutique expedition ship is the perfect way to explore this unique destination. Its refreshed ambiance can accommodate 100 passengers, offering highquality services and various activities in its spacious open decks. Two daily excursions are offered with optional activities such as snorkeling, diving, and kayaking. These unique Galapagos Cruises yachts of 36 and 20 passengers respectively offer an intimate voyage to travel around the islands, with its personalized services that resemble a private yacht. Classic beauty and elegance are the signatures of its interiors, along with open decks with an external jacuzzi to take the experience to a new level of relaxation surrounded by amazing landscapes. Photos included here -- email for more details. All-inclusive cruises of 3, 4 and 7 nights in sea view cabins with air-conditioning & private facilities. All meals included, plus welcome & farewell cocktails, BBQ dinner, and 24/7 hours self-service coffee, tea & snacks. Glass Bottom Boat (Galapagos Legend) with limited capacity. 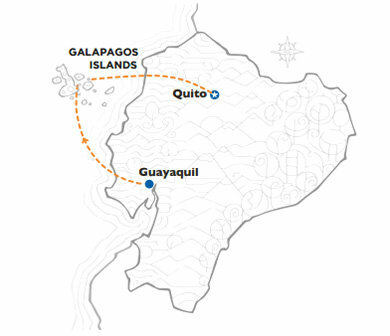 Free Shuttle service: from Quito / Guayaquil Airport-roundtrip: when a domestic flight is purchased with Nomoon. 1 Night at Hotels / Quito: Patio Andaluz, Mercure, JW Marriott, Swissotel, Hotel Quito, Dan Carlton / Guayaquil: Palace, Grand Hotel, Wyndham, Oro Verde, Hilton Colon. Galapagos Entrance Fee: $ 100 adult, $ 50 children under 12, to be paid in cash upon arrival in Galapagos. If requested this tax can be invoiced by GO. CGG Migration Control Card: $20 per person. Tips, medical services, travel insurance and others not speciﬁed. Tips: Suggested per day per person $ 20 for crew / $10 for guide. Please e-mail for available dates and payment set-up. 20% deposit of the total is required to reserve. 50% deposit of the total rate is required 180 days before the date of departure. 100% of total outstanding balance must be paid 90 days before departure date.